Q – Is there any way that we can stack the odds in our favour when selecting a fund manager, investment strategy or stocks for our portfolio? This means that the opportunity exists for investors significantly improve their chances of beating the market by. Avoiding fund managers exhibiting these characteristics (when investing in funds). Not repeating the mistakes of these managers (when doing it yourself). Being an intelligent contrarian (being skeptical of investments “fads”). Trying to avoid “losers” is very different to trying to pick “winners”. Firstly it helps to avoid over-confidence. Secondly, it’s probably more sustainable over time. This is part 3 in a 6 part series explaining some of the practical steps that investors can take to try and beat the market (mainly by avoiding common mistakes). Click here for part 1 and here for part 2. Ever wonder why fund managers can’t beat the S&P 500? Cause they’re sheep, and sheep get slaughtered. As it turns out, there’s a fair amount of truth to Gekko’s statement. A large part of the poor performance of most fund managers can be explained by the way that they manage money. Specifically, most fund manager’s stick closely to their benchmark. In other words, investors who are paying for “active” management, have only a small part of their money invested differently to the market*. Even if they are successful, the amount that’s truly “active” is not nearly enough to beat the market after fees and taxes. Funds that claim to be active but that are in reality very similar to the market are commonly referred to as “closet index” funds. Many investors go on to compound the problem further by investing in multiple “closet index” funds – as if one closet index fund wasn’t bad enough! Why does this happen? Sadly both investors and fund managers are at fault. Most investors hate losing more than they like winning (academics call this loss aversion). On the one hand, they want their fund manager to beat the market. On the other hand, they don’t want the risk that they might under-perform. This is simply impossible. Short-to-medium term under-performance is an almost guaranteed consequence of attempting to beating the market over the long-term (see my second post in this series). Unfortunately, the result of these conflicting priorities is a half-hearted attempt to beat the market which results in. Hiring fund managers based on past performance. Sacking fund managers with poor recent performance. Picking “brand name” fund managers. Selecting “active” managers that are really closet indexers. Paying active fees for a “closet index” fund. Investing in too many managers. Putting managers into style boxes – e.g. large-cap growth or small-cap value – and seeking to have the right mix of styles. Chasing investment fads and fashions. At the same time, the majority of fund managers have no incentive to be any more “active” than they need to be to raise assets and charge healthy fees. Most of them get paid based on the amount of assets that they manage, not on the performance of those assets. And there’s no better way for a fund manager to lose assets than to under-perform. This means that they have a strong incentive to stick closely to their benchmark rather than trying to pick a portfolio of stocks that they think will beat the market. Don’t get me wrong, there will be some difference between their portfolios and the index. For example, company A might be 5% of the market capitalization index. A fund manager may not like the company’s prospects so they will “tilt” away from it by only owning 2.5%. Such a tilt is an active decision, but it’s a very half-hearted one. If you don’t like the company’s prospects or the stock is too expensive then why own it at all? Why not forget it and more onto an opportunity where you have a higher degree of conviction? Sticking closely to the index also has other advantages. It means that a fund manager’s portfolio is more liquid and can accommodate a higher-level of $AuM. Remember, fund managers generally get paid on the level of $AuM that they manage, not on performance. Once again, the principal and agent issue is at the heart of the problem. Put yourself in the position of a fund manager– Why would you risk your business if you can get paid very well without sticking your neck out? True, you may win over the long-term by doing something different, however you also run the risk of hitting an almost inevitable 3-5 year patch of under-performance, during which a large portion of your clients will probably sack you. In summary, fund managers have strong incentives to flock together and investors also have incentives to pick a manager from within the flock – instead of a black sheep that’s doing things differently. 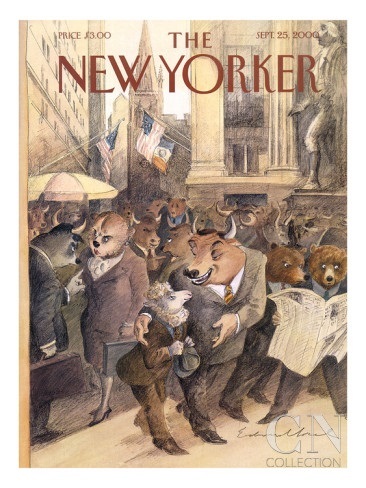 Just how sheep-like are most fund managers? In other words, what proportion of US mutual funds are “closet indexers”? Michael Mauboussin answers this question in his paper: Seeking Portfolio Manager Skill. Generally, an active share of 60 percent or less is considered to be closet indexing and active shares of 90 percent or more indicate managers who are truly picking stocks. For the past 30 years, active share has been declining steadily for the mutual fund universe in the United States. For instance, the percentage of assets under management with active share less than 60 percent went from 1.5 percent in 1980 to over 40 percent today (2012). In his paper Mauboussin cites the work of Antti Petajisto, who developed the concept of active share. Active share is a measure of “the percentage of the fund’s portfolio that differs from the fund’s benchmark index.” Assuming no leverage or shorting, active share is 0 percent if the fund perfectly mimics the index and 100 percent if the fund is totally different than the index. Here’s why it’s so hard to beat the market with low active share and an average expense ratio. Say a fund has an expense ratio of 125 basis points—roughly the average of all funds in Petajisto’s study—and the active share is 33 percent. That means that two-thirds of the portfolio is earning the same return as the benchmark index. Therefore, the active part has to make up for the difference with massive outperformance. For example, in order to equal the benchmark’s returns, the active portion needs to earn an excess return of 375 basis points. With that in mind, its fair to assume that funds with a low active share will more than likely under-perform the market. We know that between 60-80% of US mutual fund managers under-perform in any given year. And we also know that 40% of US mutual funds are closet indexers. Furthermore, we are reasonably confident that closet indexers will underperform as the maths above is difficult to argue with. So what happens to our odds of picking an active manager that can beat the market if we remove the closet indexers from our sample? My guess is that the odds of picking an out-performing fund improve dramatically from approximately 1 in 5 to approximately 1 in 2. Notice what we’ve done here. We haven’t found a way to select winning funds. We aren’t overconfident in our skill or knowledge. Rather we’ve identified an indicator, one of several helpful indicators,that can help us to avoid investing in funds that have a low probability of beating the market over the long-term. Why invert? Because it can be very hard to figure out what qualities make a good fund manager. A simpler and more reliable way approach the problem is to first think of all of the ways that a fund manager can under-perform the market. Obviously tracking the market with 2/3 of a portfolio and relying on remaining 1/3 earn enough to cover fees and costs is one way to under-perform. Once an investor has identified all of the ways to pick bad fund managers, all that they have to do is do the opposite. In this case, the opposite is to invest in companies with a high active share. By avoiding the common factors that hurt reduce our chances of beating the market, we automatically improve the base rate or probability that we will be able to select funds and strategies that might beat the market. James O’Shaughnessy explains why base rates are important in his book: What Works On Wall Street. The majority of investors, as well as anyone else using traditional, intuitive forecasting methods, are overwhelmed by their human nature. They use information unreliably, one time including a stock in a portfolio and another time excluding it, even though in each instance the information is the same. Our decision-making is systematically flawed because we prefer gut reactions and individual, colorful stories to boring base rates. Base rates are among the most illuminating statistics that exist. They’re just like batting averages. For example, if a town of 100,000 people had 70,000 lawyers and 30,000 librarians, the base rate for lawyers in that town is 70 percent. When used in the stock market, base rates tell you what to expect from a certain class of stocks (e.g., all stocks with high dividend yields) and what that variable generally predicts for the future. But base rates tell you nothing about how each individual member of that class will behave. Rather than relying on our intuition to try to pick winning managers, investors need to focus on information that helps them to improve their understanding of the base rate for beating the market. In other words, they need to identify which common attributes have the highest base rate for success. When an investor understands the attributes commonly associated with success and their base rates, they can combine the two to come up with reasonable expectations about which fund managers may beat the market over the long-term (not over a given 3-5 year period). We can illustrate how this works with an example. Let’s assume that you are asked to guess the height of the next person to enter the room. Without any other information, we might guess 170cm, which is roughly average height and a reasonable starting base rate. We are then given a clue: the person about to enter the room male. Males are, on average, taller than females, so we might adjust our estimate upwards. Finally, we are told that the male about to walk in is a professional basketball player. Basketball players are usually very tall, so we revise our estimate upwards to 200cm. In this case the clues have helped us to improve our guess by helping us to select a more appropriate base rate. Active share is one clue that can help us to improve our understanding of the base rate for beating the market. We saw this when we reasoned that removing closet indexers from our sample should logically improve the base rate for picking a manager that can beat the market from 1 in 5 (20%) to 1 in 2 (50%). Are there any other clues or pieces of information that can further assist us in improving our base rate? Yes, here are a few examples. High fees are a predictor of poor future investment returns. This makes sense as the lower the fee, the smaller the fees and costs that a fund manager must first recoup before they can beat the market. Fees are powerful a predictor of future performance. For example, here’s a quote from the Morningstar research paper: How Expense Ratios and Star Ratings Predict Success. If there’s anything in the whole world of mutual funds that you can take to the bank, it’s that expense ratios help you make a better decision. In every single time period and data point tested, low-cost funds beat high-cost funds…Expense ratios are strong predictors of performance. In every asset class over every time period, the cheapest quintile produced higher total returns than the most expensive quintile. Fund managers that have a high degree of similarity to the index struggle to beat the market because, in effect, they are the market. (minus fees, transaction costs and taxes). Active share is one measure of similarity to the benchmark, tracking error is another. Tracking error is a measure of how closely the performance of a portfolio tracks the performance of its benchmark**. Low-tracking error is also an indication of closet indexing. According to research by Antii Petajisto (as quoted by Maubousin), the average tracking error for closet indexers was low (3.5%). Conversely, a very high tracking error is usually associated with highly-concentrated portfolios (15.8%) or portfolios taking large factor bets (10.4%) – for example a bias to small-cap stocks. Petajisto found that the best performing funds were stock pickers: high active share (97%) high (but not too high) tracking error (8.5%) and a relatively low number of stocks (66). Statistics say that owning just two stocks eliminates 46 percent of the nonmarket risk of owning just one stock. This type of risk is supposedly reduced by 72 percent with a four-stock portfolio, 81 percent with 8 stocks, 93 percent with 16 stocks, 96 percent with 32 stocks and 99 percent with 500 stocks… From a practical standpoint, when Bob chooses his favourite stocks and is on pick number twenty, thirty, or eighty, he is pursuing a strategy imposed on him by the dollar size of his portfolio, legal issues and fiduciary considerations, not because he feels that his last picks are as good as his first or because he needs to own all those stocks for optimum portfolio diversification. Fund managers are also victims of their own success. Funds with strong historical performance usually receive inflows from investors (funds with poor historical performance suffer outflows), increasing the level of $AuM, and at the same time making it less likely that thefund will beat the market in the future. Jonathan Berk of the University of California at Berkeley explains this process in his paper: Five Myths of Active Portfolio Management. If investors find a manager who can consistently beat the market, they will flock to invest with this manager. Eventually, the manager will have so much money under management she will not be able to deliver superior performance. Competition among investors drives the manager’s return down to the return investors could earn by themselves. … Although there should be no persistence in active manager returns, investors still use past returns as a guide to investing their money. In fact, it is precisely because of this behavior that there is no persistence in returns. So the evidence that capital flows are driven by past performance is not evidence of investor irrationality. Investors are not chasing past performance; they are chasing future performance, and in doing so compete away the opportunity of benefiting from the skill that produced the historic superior performance. Closely related to the problem of managing too high a level of $AuM is over-diversification. 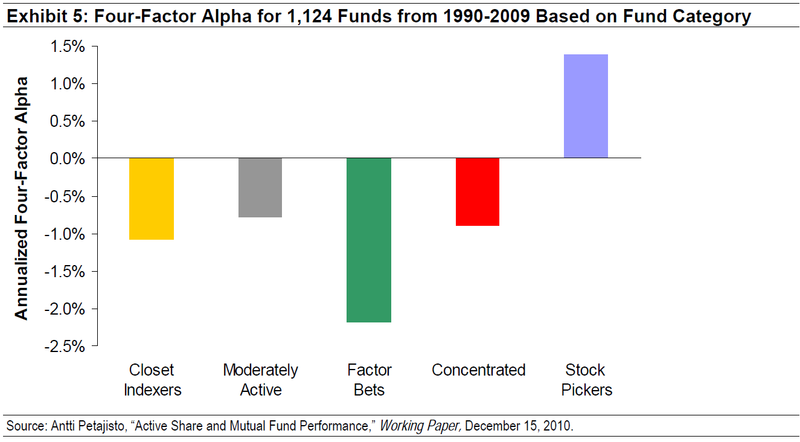 Over-diversification results in average returns. In most cases, it’s highly unlikely that there are more than a handful of compelling opportunities available at any given time. This is why holding a portfolio with many stocks often means that a fund manager’s best ideas are being diluted. Peter Lynch, a fund manager that held over 1000 stocks in the Fidelity Magellan fund (due to a high-level of $AuM), discusses the difficulties of running a large portfolio in his book: One Up On Wall Street: How To Use What You Already Know To Make Money In The Market. How do you design a portfolio to get that 12-15 percent return? How many stocks should you own?… In my view it’s best to own as many stocks as there are situations in which (a) you’ve got an edge; and (b) you’ve uncovered an exciting prospect that passes all the tests of research. Maybe that’s a single stock, or maybe it’s a dozen stocks… There’s no use diversifying into unknown companies just for the sake of diversity. A foolish diversity is the hobgoblin of small investors… In small portfolios I’d be comfortable owning between three and ten stocks. Poor business structures with inappropriate incentives = conflicts of interest created by the principal and agent problem (you can read more about it in my first post in this series). Eliminating fund managers with these poor characteristics will significantly improve the base rate of selecting a fund manager that can beat the market. Remember buying a stock = buying a piece of a business. Buy a stock because you have conviction in it, not because you have to track a benchmark. If you want to track a benchmark, use an ETF or an index fund, its much cheaper and easier. Don’t over-trade as each time you buy and sell you generate fees and taxes. 8-12 stocks is enough to diversify away most of a portfolio’s stock specific risk. The idea is to buy funds from stock categories with heavy redemptions and sell those with the greatest inflows. Over the past 20 years, it has worked pretty well because it’s directing you to cheap assets and away from pricey ones as flows usually follow hot performers and flee areas with poor returns… Using a three-year holding period and assuming category average returns, the unloved funds returned an annualized 10.4% versus 6.4% for loved. Of course there’s no guarantee those results will repeat, but it does illustrate the value in going against the grain. I’m a long-term investor, so I see this more as suggested tweaks to a portfolio rather than something that would lead me to make wholesale changes. Add some to the unloved pile and trim from the loved. We use annual flows for categories to determine what’s loved and unloved and then suggest holding for a minimum of three years. Typically, the strategy works best in big pivot years and less well when you have extended rallies for one part of the market. For 2013, the strategy suggested buying large-growth, large-value, and large-blend. The three categories returned 33.9%, 31.2%, and 31.5%, respectively, in 2013. That’s pretty good, as U.S. stocks proved to be winners, though small- and mid-cap stocks did even better. On the loved side, it suggested dumping emerging markets, foreign large-value, and real estate. Those categories returned negative 0.1%, 20.8%, and 1.6%. So far, the unloved are thumping the loved. *The bulk of the funds invested are simply tracking the market. ** It’s the standard deviation of the difference between the portfolio and index returns.